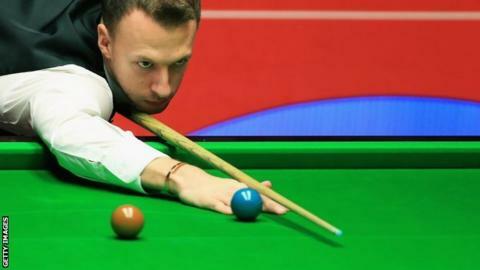 Seventh seed Judd Trump made heavy work of beating Tom Ford 10-8 in his first round World Championship match. Englishman Trump began Wednesday's session at Sheffield's Crucible Theatre 6-2 up in their best of 19 frames contest, but made a slow start. However, the 24-year-old regained a 9-8 lead after Ford missed two good chances and went on to close out the match. Earlier in the day, last year's runner-up Barry Hawkins beat David Gilbert 10-4 to reach the second round. The world number four fought back from 4-2 down to win eight frames in row. The victory sets up a meeting with Ricky Walden in a repeat of last year's semi-final, which Hawkins won on the way to a final defeat by Ronnie O'Sullivan. Former champion Neil Robertson begins his first-round match against Robbie Williams on Wednesday afternoon. And on the other table, Martin Gould and Marco Fu play to a conclusion, with world number seven Fu looking to build on a 6-3 overnight lead.